Formerly in purple velvet over boards; rebound by Marguerite Duprez Lahey in three-quarter niger; rebound in 1993 by Deborah Evetts in two volumes of alum-tawed calf (vol. 1, fols. 1-149; vol. 2, fols. 150-300). Purchased by J.P. Morgan (1867-1943) in 1919. Probably made for the monastery of San Miguel de Moreruela, the nearby sister monastery of San Salvador that was founded by Froilanus of Léon at the same time (ca. 900); it later belonged to the monastery of San Miguel de Escalada; bequeathed to the Orden Militar de Santiago de Uclés (Orden de Santiago) in 1566 by the archbishop of Valencia, Martin Pérez de Ayala; sold around 1840 for a silver watch to Roberto Frasinelli, an Italian in Madrid; sold to Francisque Michel and then to Guglielmo Libri in 1847; purchased through Boone around 1848 by Bertram, 4th Earl of Ashburnham (A catalogue of the manuscripts at Ashburnham Place, appendix, no. XV, p. 16); purchased from Ashburnham by Henry Yates Thompson in 1897; Henry Yates Thompson Collection; his sale (London, Sotheby's, June 3, 1919, lot 21) to Quaritch for J.P. Morgan (1867-1943). Ms. written and illuminated in Spain, in San Salvador de Tábara, ca. 945. Texts: Beatus, Presbyter of Liebana, In Apocalipsin (fols. 1-233); Isidore of Seville, De adfinitatibus et gradibus (fols. 234-237); St. Jerome, Commentary on Daniel (fols. 238v-292v); an anonymous discussion of the Apocalypse and comments on Beatus's work (fols. 294-299). According to the colophon (fol. 293) Maius was both the scribe and the illuminator, and executred the work at the command of the Abbot of the Monastery of St. Michael. Decoration: 68 full-page miniatures, 48 smaller miniatures; diagrams, colored initials, and ornaments; Spanish Mozarabic style. St. Beatus of Liébana completed his commentary about 776. The long cycles of pictures accompanying it constitute the greatest achievement of medieval Spanish illumination. 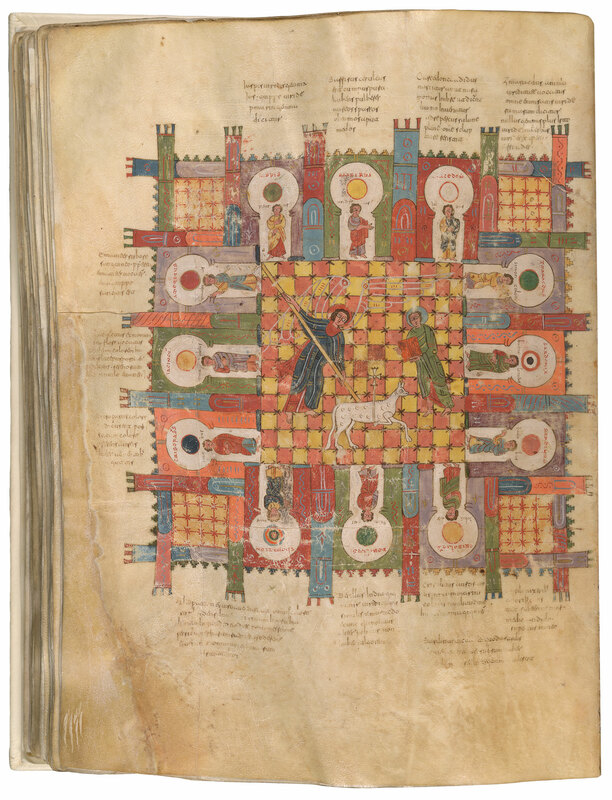 The Morgan Beatus is important because it is the earliest complete copy and thus stands at the beginning of the Beatus tradition. Although the book was ordered for Escalada (consecrated in 913), it was not made there, as Maius worked in the tower scriptorium at San Salvador de Tábara, where he died and was buried in 968. Maius tells us he made the book so that the "wise may fear the coming of the future judgment of the world's end."